If you’ve never made a wish upon a star, it is time for you to Wish Upon a Jackpot and give this slot machine a shot! This game was developed by Blueprint Games, a popular developer responsible for the success of many casino online machines. They’ve done a great job combining vivid graphics with a fairytale-like story to create a slot that looks quite magical. With a total of five reels and 20 paylines, the slot offers plenty of features and extra rounds that will keep players of any skill levels happy with the gameplay. Let’s take a look at the betting rules before we dive into the features of Wish Upon a Jackpot casino slot online. 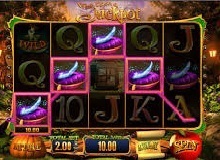 As we already mentioned, the slot features a total of five reels and 20 paylines. Each reel carries three symbols. Almost all Blueprint Games slot machine feature the exact same structure, which makes the Wish Upon a Jackpot slot far from unique. However, it is important to mention that the number of paylines is not set in stone. That means you can choose how many paylines you want to activate. Activating less than 20 paylines will reduce your chances of scoring great combinations but it will allow you to bet less and save money for other spins. It is up to you to decide whether you want to take a higher risk and attempt to land the more rewarding features or choose to play it safe. Either way, you need to choose a total bet size before hitting the spin button, which looks like an apple. The highest paying symbol of the Wish Upon a Jackpot game is the wild, which is represented by the frog prince. A combination of five wilds in one spin will reward the player with 500 coins. After the frog prince, the next highest paying symbol is the stacked title symbol, which is worth 400 coins if you land all five of them. The lowest paying symbols are the playing cards from ten to ace. What makes this slot machine so interesting to play is the Fairy Godmother Spins feature, which gets activated randomly during the gameplay. Once the feature is activated, you get to choose between three pink bubble orbs located above the reels. Your choice will reveal one of the five bonus features that you will be awarded with, including the Pinocchio wilds, Pussin wilds, Wild reels, Fairy win spin, or direct entry into the feature round. Each of these features brings a variety of rewards but the most interesting one is the feature round. You can either gain entry into this round through the Fairy Godmother spins or by landing three or more fairytale book symbols. Either way, you will get to choose one of four books that will reveal the feature. Three Little Pigs Free Spins Bonus – Awards the player with additional wilds to increase winnings. Rapunzel Free Spins – Offers the player an unlimited amount of free spins and increases the multiplier with each step the prince takes towards the top of the tower to rescue the princess. 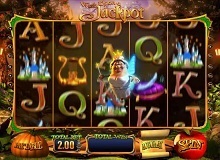 Jack and the Beanstalk – The feature increases multipliers as Jack makes his way along the beanstalk, allowing the player to collect big rewards. Rumpelstiltskin’s Deal Maker Bonus – The character offers the player a chance to take a bonus. The player can either accept it or decline it in hopes the character would offer a larger bonus. 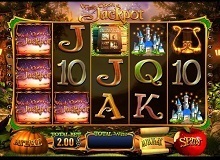 Wish Upon a Jackpot casino slot online offers a variety of interesting features that make the game worth your time. It’s every player’s wish to score one of the top prizes or land an awarding feature when they play Wish Upon a Jackpot for real money. If you’re wondering whether your wish can come true, the possibilities are truly endless. However, keep in mind that you are more likely to score high wins if you keep your bets near the high end of the scale. Besides great features, this slot machine will entertain you with top class animations and great images, which makes it one of the best slots ever released by Blueprint Games.